Carlos Andrés Gómez (C'04), award-winning NYC poet and actor, has a voice. 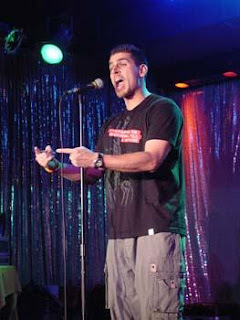 ...And it's channeled through his passion for the spoken word. After checking out his videos, the best word to describe this guy is captivating! At Penn, Carlos was the founder of The Excelano Project one of the nation's premier spoken word/performance poetry collectives. You may have seen him earlier this year on the cover of the February issue of Brass Magazine and on the most recent season of HBO's Russell Simmons Presents Def Poetry. His passion for this art form has opened doors into the acting world as well. Click here to watch Carlos in action as he discusses his craft and his involvement in the film The Inside Man and HBO's Def Poetry. Congrats Carlos! Who says a Wharton degree won't get you anywhere! Carlos is actually a College '04 grad, but doing well all the same.